When cooking chicken pot pies, making two then freezing one gives you a quick meal for a future night when you're too busy to cook. A frozen cooked chicken pot pie will keep in your freezer for up to three months, and you don't have to thaw it before popping it in the oven for reheating. On average, one 1/2-lb. chicken pot pie contains 500 calories, 14 g of protein, 25 g of fat and 54 g of carbohydrates, the U.S. Department of Agriculture's Nutrient Data Laboratory calculates. One pie also has 1229 milligrams of sodium, 53 percent of your recommended intake for the day. Preheat your oven to the same temperature as the original recipe calls for. If you cooked the chicken pie at 350 degrees F, set the oven for reheating to 350 degrees F, too. Place the chicken pot pie in the center of your oven. Bake for just less than double the time of the original recipe, the Cooking Inn website instructs. For example, if you originally cooked the pot pie for 30 minutes, you'll need to heat it for about 50 minutes this time. Watch the crust of your pot pie carefully during cooking to prevent burning. If you notice the crust beginning to brown, cover the dish lightly with foil. Place an quick-read thermometer into the center of the pie about 10 to 15 minutes before cooking time is up to check for doneness. 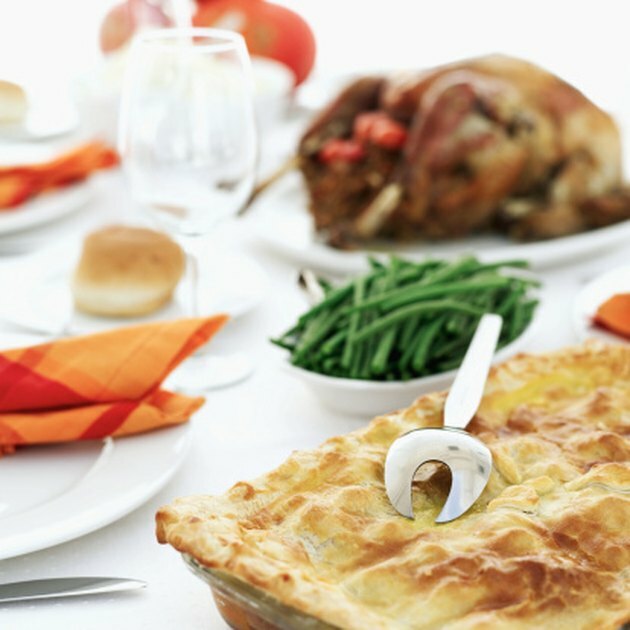 Continue cooking the pie until the middle reaches 160 degrees F.
If possible, undercook the chicken pie before freezing to prevent the ingredients from overcooking when reheating. Allow cooked chicken pies to cool for 30 minutes to an hour in the refrigerator before transferring to the freezer. The bottom crust of chicken pies may become soggy from storage and reheating. Omit the bottom crust and place the pastry only on the top if possible.